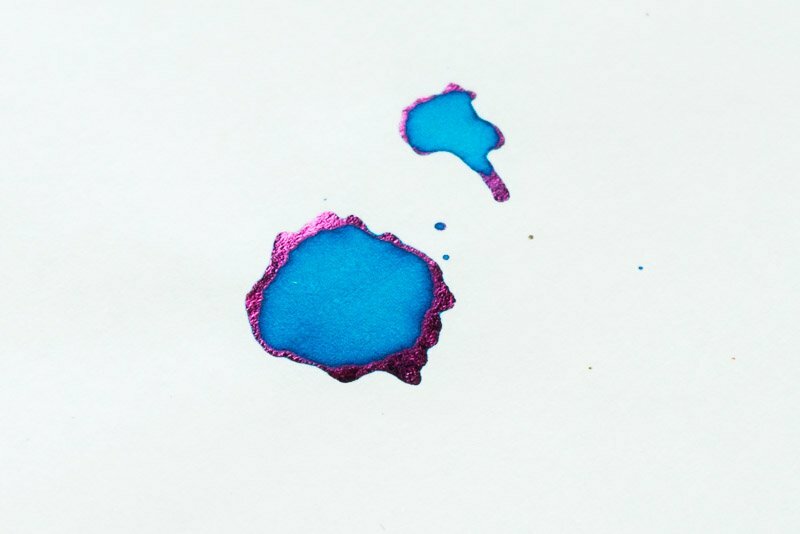 What Is Sheen In Fountain Pen Ink? It seems that the world of fountain pens has been taken over by sheen. Read any ink review or browse any online fountain pen community and you’ll frequently see sheen mentioned. So what is sheen in fountain pen ink? What does it look like and how does it happen? Do you have to have a special pen, ink or paper? 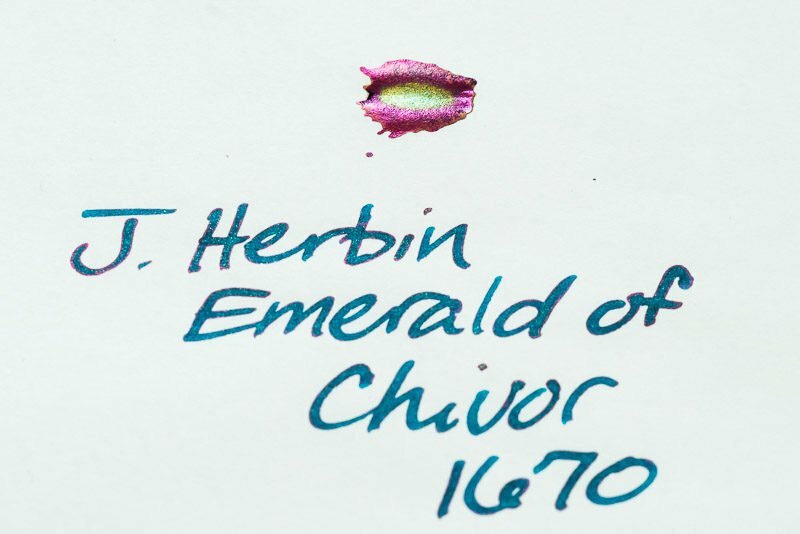 Read on to discover the basics of fountain pen ink sheen. The most basic description of sheen is that it’s a color that is present in dried fountain pen ink that’s not part of the “intended” color. I put intended in quotes because many ink manufacturers are actually trying to get high amounts of sheen in their inks due to its popularity, but by “intended” I mean that a blue ink might have red sheen. Since you don’t normally expect blue ink to appear red, it’s not really the intended color. 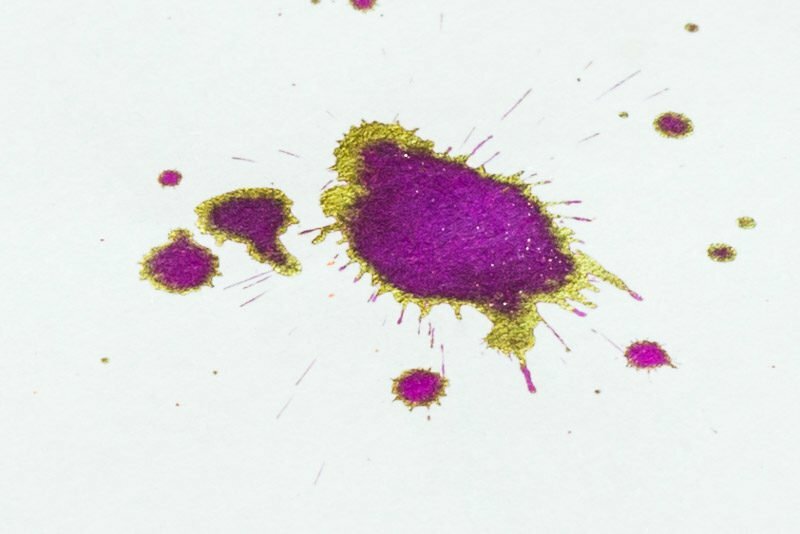 Sheen is typically only visible on dried ink. When you look at a dry ink sample from an angle with bright light, you might see some sheen. It typically looks metallic, so the bright light helps it to shine on the paper. In some cases it can be easy to miss, so be sure to look at your paper from different angles in different light and see if you catch a bit of sheen in your writing. While there is no direct correlation to the ink color and the sheen color, you’ll often see blue ink with red sheen and purple/red inks with gold sheen. Of course, you’ll see lots of other different color combinations out there as well, so you can’t use this as a rule of thumb. How do you get an ink to sheen? Any time you write with a fountain pen, there are three main factors to consider… your pen, ink and paper. To get sheen, you need an ink that sheens, paper that allows ink to dry slowly and a pen that writes fairly wet so you get a bit of ink pooling while you write. I’ll discuss each in a bit of detail so you can see that getting an ink to sheen isn’t always as easy as just putting pen to paper. Let’s start with the ink. There are some inks that simply do not have any sheen, so if you want a fountain pen ink with sheen, you’ll have to choose the correct one. If you’re wondering if a particular ink has any sheen, you should be able to figure it out with a quick search online. Once you’ve found an ink that you like, it’s time to move on to the next piece of the puzzle. The paper you use is arguably the most important part of the sheen equation. If you have an ink that is known to sheen but use it on a low-quality or highly-absorbent paper, you will not see any sheen. Why is this? Some papers soak up ink quickly. This is what can cause feathering, but it will also prevent sheen. In order for sheen to occur, the ink has to dry slowly. Because the ink dries slowly on papers that cause ink to sheen, you’ll want to be careful not to smudge your writing and give it plenty of time to dry. If you do ink splats, they might even take more than 15 minutes to fully dry! The final thing to consider is the pen you use to write with. 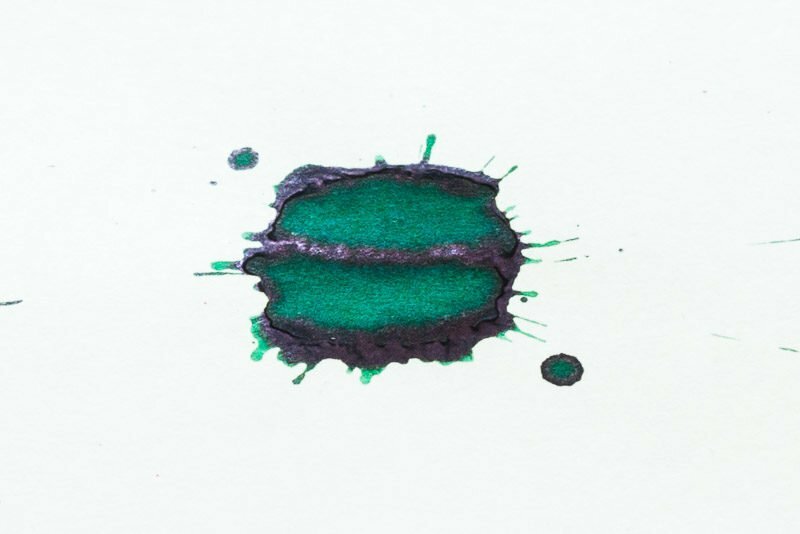 You’ll notice that a lot of sheen examples are merely splats of ink on paper. This is not just because it looks neat… it’s also the easiest way to show sheen! A big, wet splat of ink is a lot more ink than a pen will ever put on a piece of paper. To get sheen out of an ink while writing with it, you’ll need a pen that lays down a wet line of ink. This doesn’t necessarily mean a big, broad nib, as a fine nib can coax some sheen out of inks as well, but it has to be a wet writer. You can see that there is obvious sheen on one writing sample and none on the other. Since the ink and pen were exactly the same, this is entirely due to the paper I used. Again, since different nibs were used, the amount of sheen you can see is different. You’ll have to trust me that it’s even more pronounced in person (sheen is tough to photograph!). What are the best inks and papers for sheen? While new inks are coming out all of the time that are “sheen monsters”, there are definitely some that belong in the Sheen Hall Of Fame. For example, Organics Studio Nitrogen is famous for how easily it sheens. It’s actually hard to tell what the real color of the ink is. If you want almost guaranteed sheen, this might be a good ink to start with. 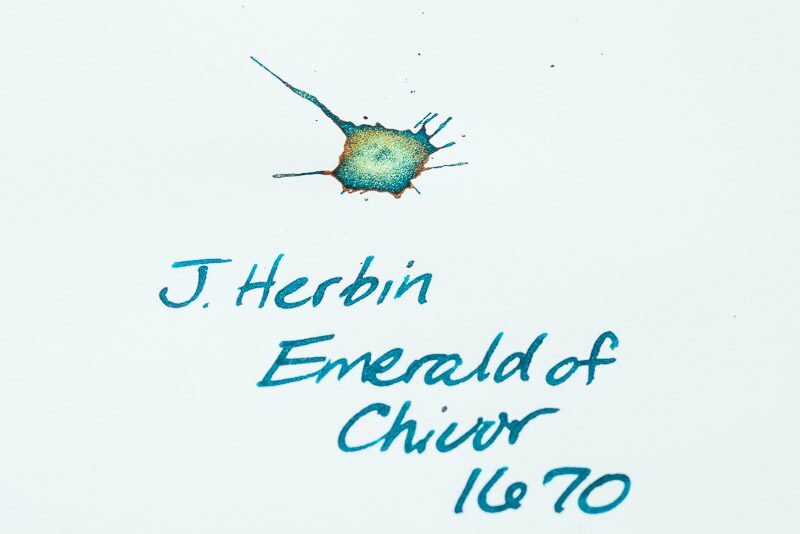 J. Herbin Emerald of Chivor 1670 is also a great ink with lots of sheen (used in these examples). Of course, inks that sheen are in no short supply, so I highly suggest doing a bit of research to figure out which ones you like the look of. If you want to experiment without committing to an entire bottle of ink, you can buy ink samples of some of your favorites from your preferred online pen retailer to see which you like best. As for paper, the current hands-down favorite is a Japanese paper called Tomoe River (used in some of these photos). If your ink won’t sheen on this paper, chances are it won’t sheen at all. I’ve had mixed luck with most other papers. Some papers will show sheen with a splat, but not with writing. Others will not show any sheen at all. If you want guaranteed sheen, get some Tomoe River. 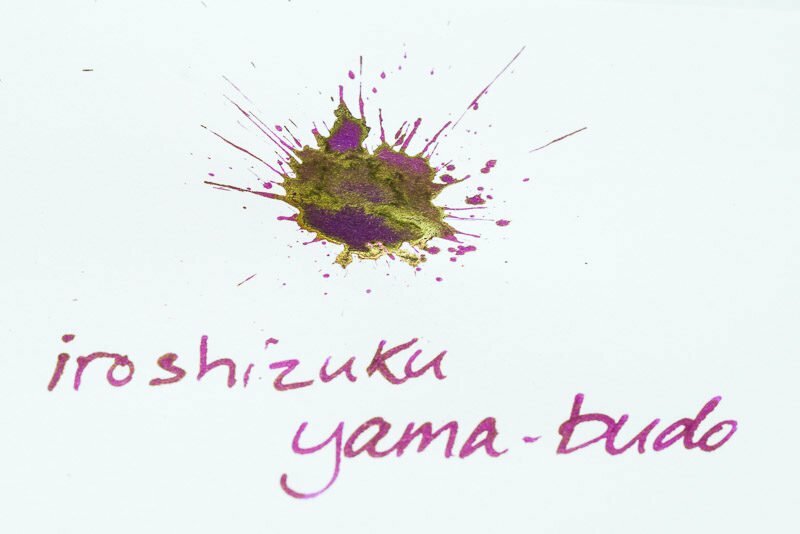 Now that you know what fountain pen ink sheen is, have fun experimenting with different ink/pen/paper combinations. When in doubt about a particular ink, try out a big wet drop on some good paper. Be patient, let it dry completely and then take a look. You might just be surprised by what you discover! If sheen interests you and you’d like to learn more about the science behind it, a great place to start would be this article on thin-film interference. A very simple summary is that when light is reflected from a thin film (ink on paper), the light waves that are reflected from the top of the ink layer interfere with the light waves that are reflected from the bottom of the ink layer. This interference causes us to see different wavelengths of light, thus creating sheen that is a different color than the original ink. 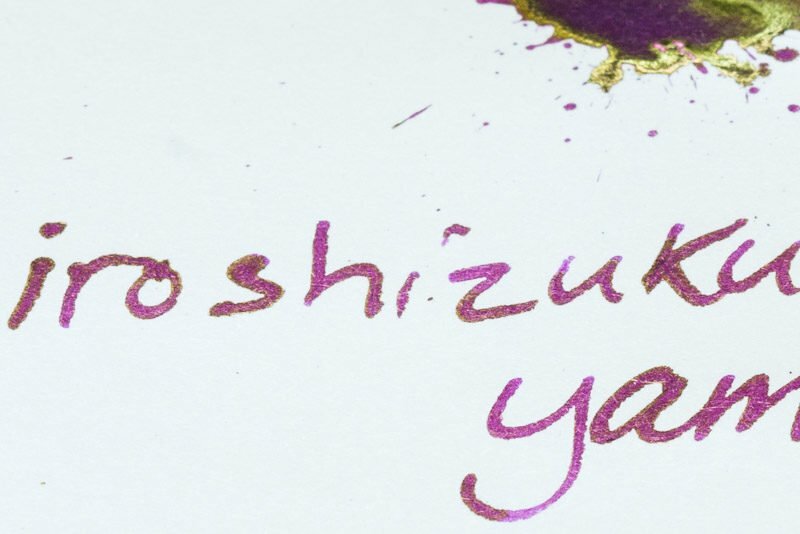 I really love sheen, my current favorite sheening ink I’ve tried is Sailor Oku-yama, but I’ve been itching to try the Rober Oster inks; they look super nice! As someone I hat hasn’t gotten any sheen inks or any shimmer, this is a very intertesting article! I’m glad to hear you found it interesting! Thanks for reading. 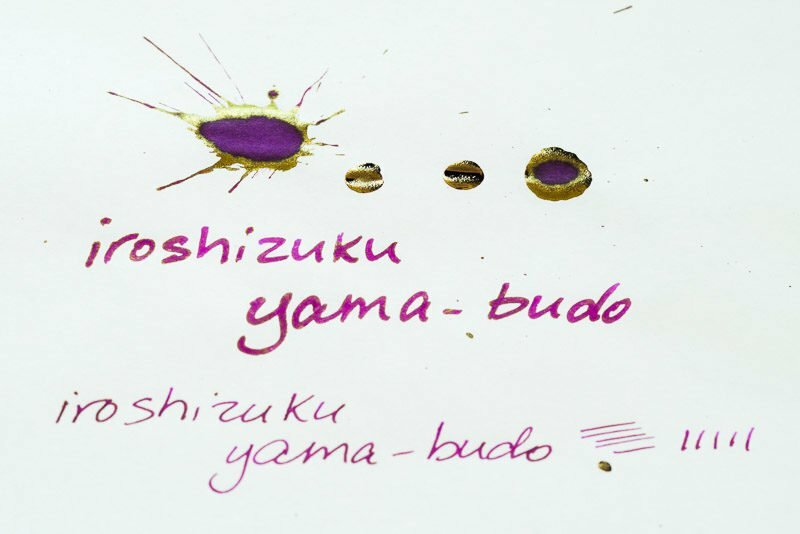 I ordered a bottle of Iroshizuku Yama-Budo because of this blog post. I still haven’t tried it out because I can’t decide between the white and cream Tomoe River paper. Which color do you prefer? You’re going to love it, Kelly. It’s a wonderful ink, even without the beautiful sheen. I’ve only tried the white Tomoe River, so I can’t speak to the cream from experience, but I do usually prefer white paper in general. Forgive me if this is a newbie question, but you wouldn’t want to blot writing that you hoped to see sheen in? Exactly! If you were to blot ink, you would greatly reduce the chance of sheen. I’d imagine there are still some inks that would sheen even if you did blot them, but most probably wouldn’t. Blackstone sheening inks like Barrier Reef, Sydney Harbor Blue, and Cypress (this is a scented ink) are my favorite sheening inks because they will dry much better than (and doesn’t smear) like Organics Studio’s monster sheening inks.. but don’t get me wrong. Organics Studio’s Nitrogen, Walden Pond, and Twilight are part of my permanent collection. Blue Gum (scented) by Blackstone is also sheening but I haven’t tried it yet. If I could find a gold sheening (and I don’t mean shimmer) ink that would sheen like a monster sheening ink, I would be in heaven. I have Pilot’s Iroshuzuki Yama-Budo and Sailor’s Granade, and they will sheen, just not as much as the ones I’ve previously mentioned. Thankfully the color of the inks are so very lovely that I am happy to have them in my collection regardless of the amount of their sheen. 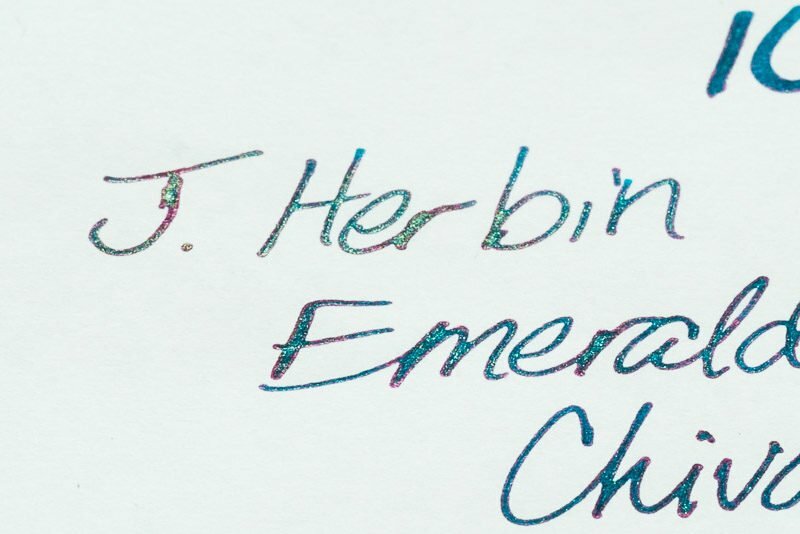 Diamine’s Bilberry is pretty fun too, come to think of it. Ahh.. so many inks, so little time. I haven’t used the Blackstone inks before, but they sound great! Something that dries without smearing and still has big sheen would be wonderful to use. 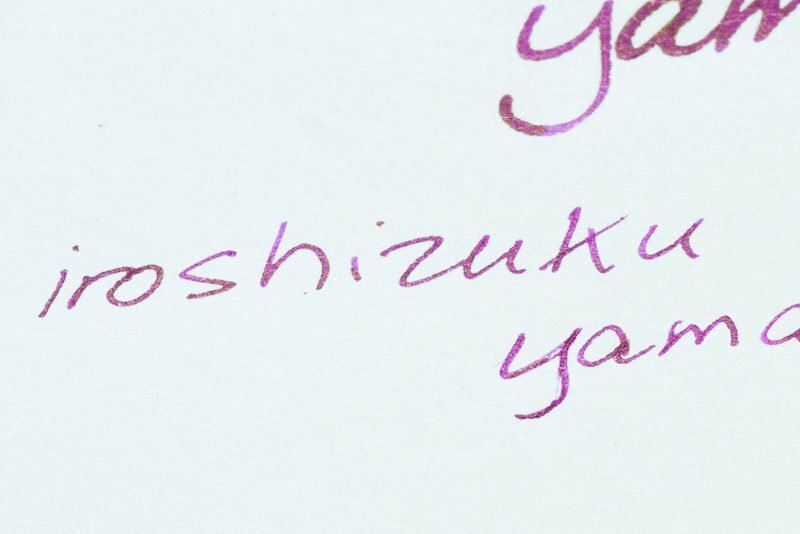 I don’t know if you’ve tried Iroshizuku Tsutsuji or not. It has a lot of gold sheen, but mainly in the splats. In normal writing, it’s still very pink. With the right pen you might get a lot of sheen, but I’d imagine it’s still nothing like a Walden Pond. Regardless of whether or not you find the perfect gold sheening ink, I’m sure you’ll enjoy the search! This is kind of an incomplete idea of what sheen is, because it’s not addressing that sheen has a lot to do with the chemistry of the ink. I am not a scientist, but I don’t think it’s a coincidence that blue inks tend to sheen red, while purple inks sheen gold/green. It surely has everything to do with what goes into creating the colors of these inks. The chromatography that most lay people do of these inks doesn’t really show you what goes into making them. These are sophisticated and complex dyes that you need to analyse via gas chromatography to get the real elements that go into them. I have a feeling, though, that these elements are what create the sheen. I also suspect that you’ll see a lot of commonality into what goes into the various color families of inks. Blues will have similar elements, pinks will have another, and purples yet another. And so on. So that’s the first thing that would play a role in sheening. Also, it’s not a coincidence that most of the sheening inks have a high degree of color saturation to them, which means the makers are using more dye to create these rich, intense colors. So what’s likely happening is that there’s so much of the dye components in these inks that we can see a process of them breaking apart when the ink is drying. It’s this small degree of separation as like goes to like when they start mixing with air that starts creating the sheen. The reason they don’t pull completely apart is because the ink dries before a full separation can happen. You won’t notice this with less saturated inks, because there isn’t enough of a concentration of the dye’s components to make that process visible to the naked eye; however, I’m willing to bet that, if you put the “low” saturation inks under enough magnification, you could see some of the same sheening effects, were you to use them in the same types of pens and papers that bring out sheen in the saturated colors. That’s because the same family of chemicals goes into making, say, Diamine Misty Blue as in Diamine Majestic Blue. The only real difference is the concentration of the dye used to create the latter’s intense color–enough for us to see the sheening that famously comes with it as the dye oxidizes. I completely agree that sheen as to do with the chemistry and components that make up any given ink. I even remember reading something about particular dyes that are commonly used for specific colors (blue, for example, usually use Triarylmethane dye), which I would imagine has a red sheen. I intended the article to be geared more towards people who had heard the term “sheen” and didn’t know what it was. The title “What Is Sheen” is intended to refer more to the aesthetic question rather than the chemical question. Also, I just simply don’t know the science behind the compositional side, so there’s no way I could write an article about it. If you ever come across one, please send it my way. I think it would be a fascinating read! The fact the ink/sheen color combinations are so consistent across brands and physical applications suggests that it is not solely a thin-film interference phenomenon, but rather a property of the (crystalline structure of?) the particular dyes used … but this is not my field. Why not try asking Tyler, the creator of the Organics Studio monster sheeners, who has a degree in biochemistry? Jon, there’s probably some truth to that suggestion. I would imagine that the consistency in sheen color has something to do with the size of the dye crystals and how they interact with light, making the thin-film interference not random like you’d find on a soap bubble, but predictable like you see on a flower petal or butterfly wing. Maybe I will ask around a bit more and try to find a definitive answer as to why it occurs. Thanks for reading! 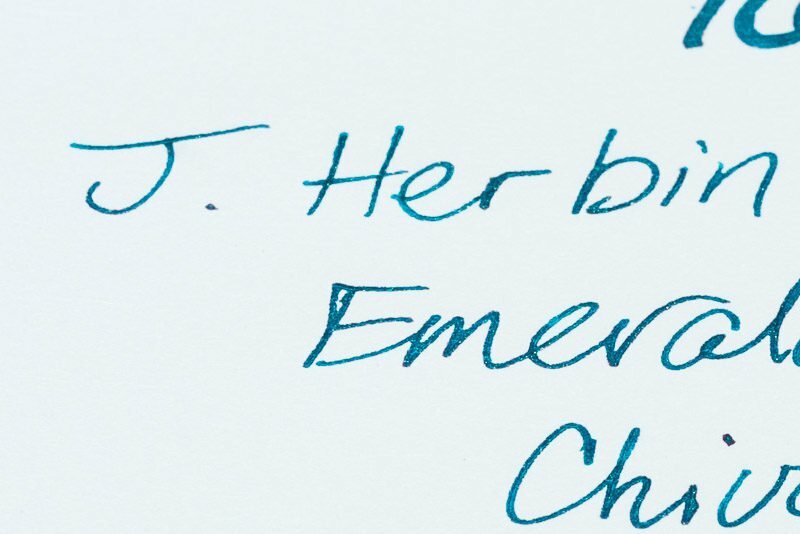 Hi John, Where do I purchase Sheen Inks and Tomoe River Paper. Thank you. Hi Diana, you can purchase sheening inks and Tomoe River paper on Amazon through the links in my article or at any major online pen retailer such as Vanness or Goulet. If you live in a major city, you might be able to find some there if you have a pen shop, but online is definitely your best bet.